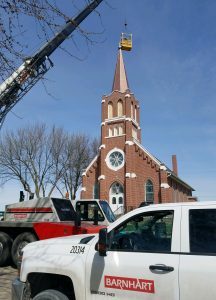 A Catholic church in Utica, Nebraska had been missing its steeple for many years, seventy to be exact. Back in 1949, the steeple at St. Patrick’s Church had been struck by lightning and consumed by flames. In the following decades, it was never replaced. 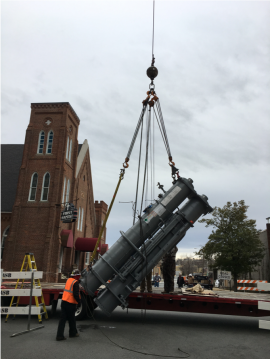 Thanks to the efforts of an anonymous donor and church pledges, a new copper steeple made its way to its permanent home in Utica this week. Barnhart played a critical role in restoring the steeple to its former glory. The church needed a company capable of lifting and setting the 30-foot tall steeple. It also weighed 23,000 pounds, even though the copper-clad steeple was hollow. Barnhart’s Lincoln office stepped in and donated its services. On April 13, Barnhart used a 100-ton mobile crane to lift the steeple and place it atop the bell tower. According to the local newspaper, The Seward Independent, the historic moment was witnessed by a delighted crowd of 25 people and two dogs. Barnhart has years of experience in successfully performing projects for customers during outages and turnarounds. 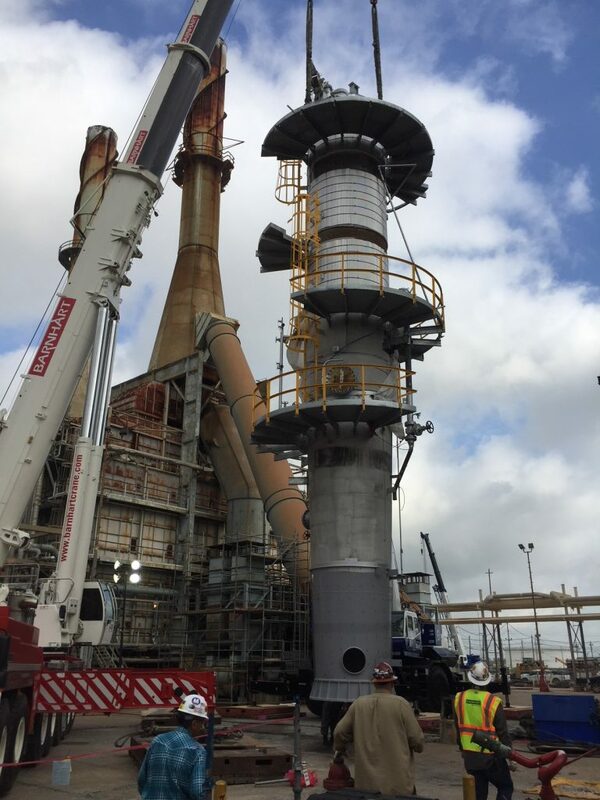 So when we were hired to remove and replace a T-805 tower during a turnaround at a refinery in Texas, it was a project that was right in our wheelhouse. The new T-805 was located in the refinery’s laydown yard. The team used an LTM 1400, a 500-ton hydraulic crane, to load the tower to a Goldhofer trailer with 10 lines PST. The 500-ton crane was then moved to the existing T-805 tower location where it was used in conjunction with a tailing crane to lift and tail the tower. Once the old tower was in the horizontal position it was loaded on to a Goldhofer trailer and transported to the laydown area. The new T-805 was then transported to its final location, lifted and tailed to the vertical position and set in place. The project was performed by Barnhart’s Houston office. In addition to crane services, Barnhart provided client specific training needed to perform work inside the refinery. 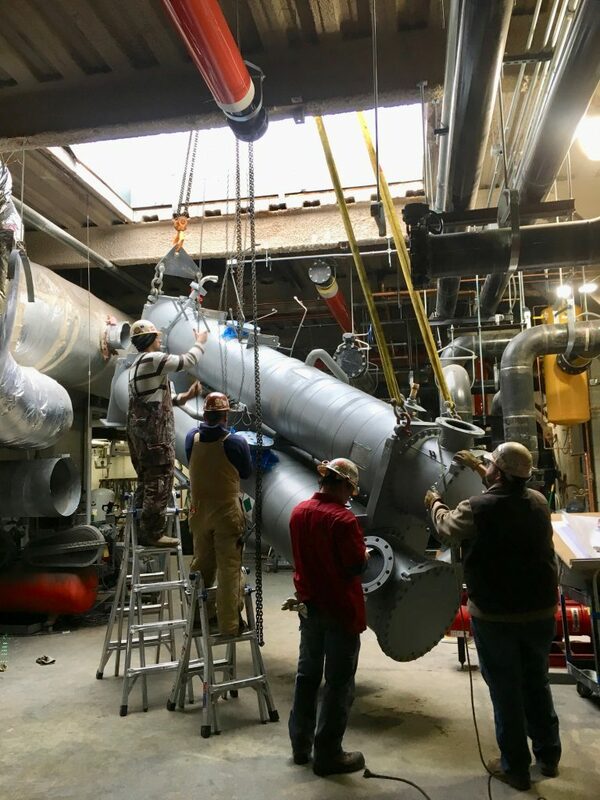 The team remained on the site for three months operating 265-ton crane service to remove and reinstall E-803 exchangers and miscellaneous equipment during the turnaround. Barnhart was hired to install a 15,679-pound chiller through the top of an 11-story building in Little Rock, Ark. In order to get the proper setup for the crane, the team had to use a public street. This required blocking off several blocks in downtown Little Rock to reduce traffic. The team used a 275-ton crane to lift the chiller to the top of the building where it was to be lowered through a roof hatch. But preplanning had determined that the chiller was larger than the opening on the roof. Barnhart’s engineering team helped create a rigging system using a swing away jib that allowed the team to invert the piece so it could go vertically through the hatch. Then they used two 10-ton chain falls to level the piece out and set it into place with air skates and a motorized pallet jack. This innovative approach provided the customer with a unique and cost-effective solution. 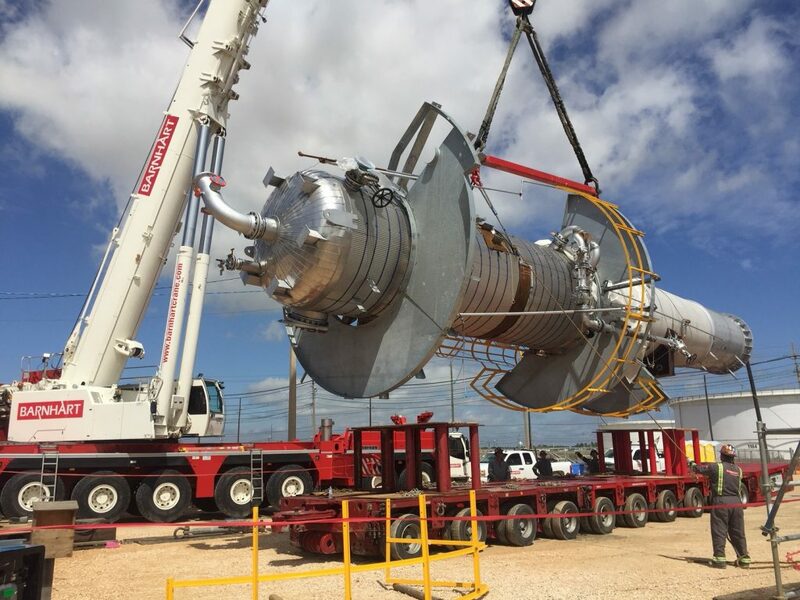 Hauling oversized cargo is nothing new for Barnhart, so a project to receive and transport a degassing and recovery column from the Port of Houston to a plant site in La Porte, Texas was right in our wheelhouse. The recovery column was nearly 200 feet long and weighed 529,104 pounds. It was offloaded at the port to two 8-axle-line EasTrac transporters with bolster configurations. 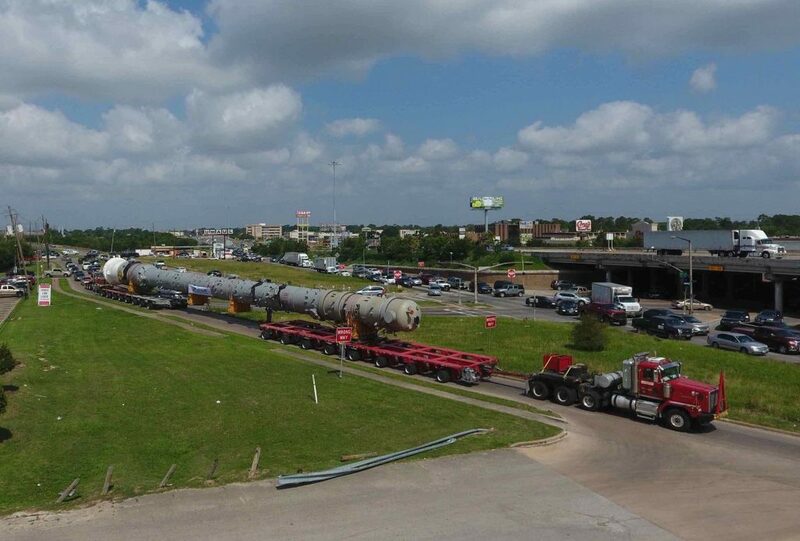 While the permitted route to the plant was just 35 miles, it included safely navigating the column through the congested city of Houston. Once the recovery column was delivered, the degassing column was transported two days later by a 12-line EasTrac transporter to the site. Both columns were delivered safely and on time. Transport Components 1000 Miles. Repeat. Barnhart projects often have a long timeframe of at least several months, but in the case of a recently completed project, the timeline was more like six years. As featured in an article in Waterways Journal, the project to deliver six water runners from New Orleans to a hydroelectric plant in Ludington, Michigan started in 2013. But the plant could only accept one at a time. Each trip was 1,100 miles and took an average of six months. The runners would arrive in New Orleans by vessel from Shanghai, China. Each one weighed over 610,000 lb., was 28’ 2” in diameter and stood 16′ tall. It was accompanied by a wearing ring 24′ in diameter and 3′ high. 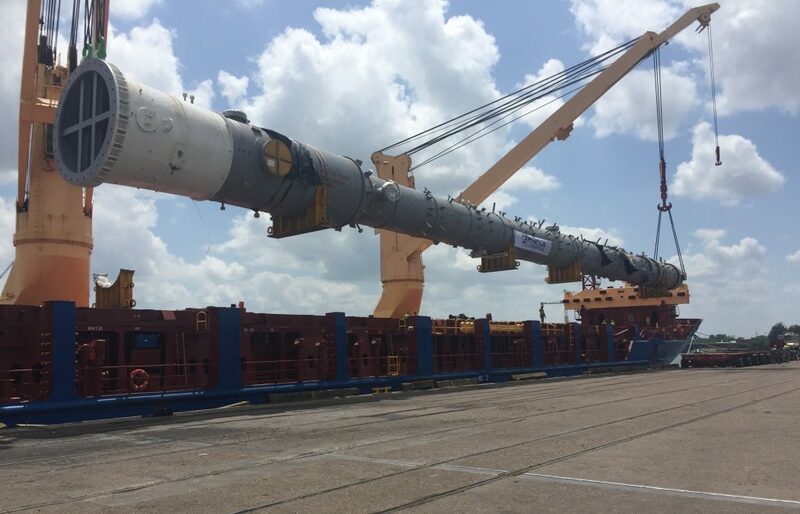 The components were offloaded to a hopper barge in New Orleans for transport to Chicago. The barge was necessary to clear the low-lying Lemont Bridge on Illinois’ Des Plaines River. With an air draft of 19’6” from the bottom of the bridge to the top of the water, the barge cleared within only two feet. At Barnhart’s heavy lift terminal at the Port of Chicago in Calumet, Illinois, the cargo was transferred from hopper barge to an ABS deck barge with a TC3000 truck crane to continue its journey across Lake Michigan. 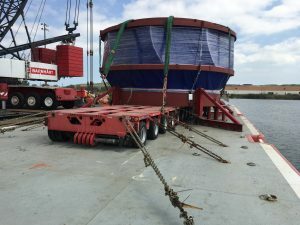 In Ludington, the wearing ring was picked off the deck barge via 60T crane, while the water runner was rolled off using a 14-line single-wide PSTe Goldhofer trailer, transported to the plant and staged for placement. Barnhart’s Chicago branch handled the project. According to Project Manager Jose Alva, the biggest challenges were communication and safety. Watch a short video of the 1000-mile journey. 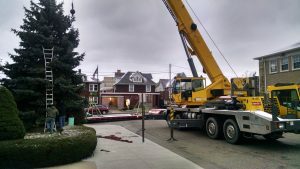 Barnhart’s Canton, Ohio recently had an unusual assignment – moving a Christmas tree from its site to a location in downtown Central Plaza. The 35-foot, 3,000-pound blue spruce was donated by St. Joseph’s Catholic Church, located just a few blocks away from the plaza. It was planted in 1991, according to Monsignor Frank Carfagna, and had outgrown its location. 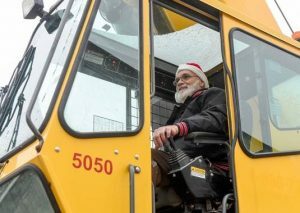 Barnhart’s job was to provide equipment, a crane operator and two riggers. On the morning of the job, the riggers rigged the tree, and a city worker cut through the trunk with a chain saw. Barnhart’s crane operator, Mark Shumaker, lifted the tree from its stump with a Grove 50-ton crane and expertly guided it to a double-drop trailer for the short trip. At the site on the plaza, the tree was carefully placed by the crane into a receptacle on the ground. According to Shumaker, the biggest challenge with the job is one most of us face at Christmas, making sure the tree stands straight. The Barnhart branch, which was formerly Selinsky Force, has been helping with the tree move, gratis, for approximately two decades. The tree was part of the Light Up Downtown event on Dec. 6, which kicked off the Christmas season in Canton. A year-long project at the Hanford Nuclear Site in Washington involving Barnhart recently received an Engineering News Record (ENR) 2018 Best Project designation. Barnhart’s role was to provide operated crane service and other assistance during the 14-month job. The project involved removing and strengthening the roof of an aging reduction oxidation facility. The roof area of the five story-facility was 90-ft-high, 388-ft-long and 64-ft-wide. Barnhart was able to supply a crane that was capable of reaching both sides of the building from one location, which cut down on setup time. During the course of the project, Barnhart removed multiple layers of roofing including gravel insulation and rubber roofing. Due to underground issues at the site, there were ground load bearing considerations. 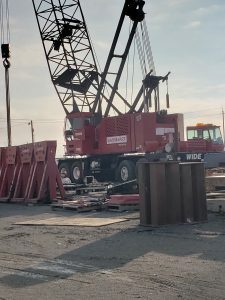 Barnhart was able to use some of their cool tools like bridge jumpers, which were able to span over low tolerance areas of the ground to safely move the crane around obstacles and minimize down time. The strengthening of the roof involved adding a new structure that integrated into the existing roof that utilized pre-engineered building elements and customized them to act as a new roof structure. Barnhart’s crane was able to speed up installation by preassembling some of the new structure on the ground minimizing installation time for the crew on the roof. Being a Department of Energy (DOE) site in a desert location, there were other considerations. The crew wore body monitoring equipment to measure real-time heart rate and body core temperature as well as personnel badges to measure and monitor radiation dose. Barnhart’s Richland, Washington branch headed up the project. “Probably the biggest challenge of this job was being able to construct and move the crane in a timely manner in a tight location and abide by all the requirements for a DOE nuclear site,” said Justen McCarthy, branch manager. While Veterans Day pays tribute to all American veterans – living or dead – it especially gives thanks to living veterans who served their country honorably during war or peacetime. Barnhart is thankful to have veterans from many branches of the military among our ranks of employees. They serve in positions from logistics to engineering to trucking. We are proud of their service and their values of discipline and dedication. 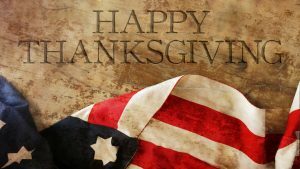 We are also thankful for our over 1200 employees nationwide who represent Barnhart every day. It’s hard to imagine that a company that started with 10 employees in one single Memphis location just a few decades ago would grow to a company our size. Being thankful is a big part of our mindset at Barnhart and is embodied in some of our core values. It extends to our appreciation of our employees who go out and provide quality service to our customers every day. To our engineers and fabricators who, through innovation, create better methods and tools to meet the needs of our customers. To our project managers and others who ensure the safety of our employees, customers, vendors and the general public on the job. As Thanksgiving approaches, we count our blessings and are especially grateful to our customers who enable us to do what we love every day. Repeat customers who show their confidence in our past performance by giving us more opportunities. New customers who are willing to give us a shot based on our reputation and history and allow us to exceed their expectations. We wish everyone a Happy Thanksgiving and hope it is a day filled with gratitude, fellowship, delicious food and, of course, football. Barnhart is often called to move cargo large and small and sometimes even antique. 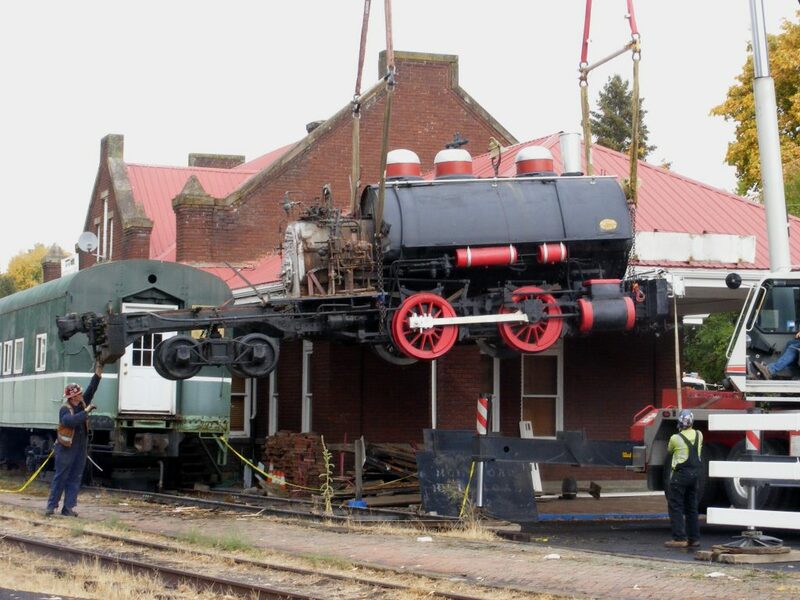 Barnhart’s Spokane branch was hired to move a 1920’s era Forney steam locomotive from its site at the Pullman Depot Heritage Center in Pullman to the Inland Northwest Rail Museum in Reardon, Washington. It was a task that was familiar, as Barnhart brought the engine to Pullman in 2008. The locomotive weighed approximately 60,000 lbs. The crew used a 100-ton Linkbelt machine, a crane operator and a couple of riggers to complete the team. The main concern was making sure the components of the antique piece were protected during all phases of the project. Barnhart carefully fastened slings and chains to the engine, so it could be lifted and moved to the truck. The locomotive was set on a heavy haul seven-axle lowboy for the 100-mile trip to Rearden. At the Northwest Rail Museum, it was offloaded and set on their display track. Observers watching at the Pullman Depot witnessed quite a show. “The team hoisted the steam engine into the air, expertly maneuvered it alongside our depot, and gently placed it on a trailer for the trip. The entire process was accomplished with care and precision,” said Linda Hackbarth, Co-chair of the Pullman Depot Heritage Center Project. Watch a video of the project here. You wouldn’t expect a crane company to devise a system for wind maintenance projects that requires fewer cranes, but that’s what we’ve done with our custom designed blade bar. The blade bar replaces the industry standard two crane method for wind turbine blade removal, requiring only one crane. One less crane means less mobilization, labor, truck and equipment costs for our customers. Reduced crew and crane operations also mean a safer process. The blade bar is a metal frame, adjustable in five-foot increments from 5’ long to 115’ long, making it fully adjustable to the blade’s specs. The length of the bar is adjusted on the ground and a sling is attached at one end. The blade is then lifted by a single hydraulic or crawler crane to the height of the damaged blade, eliminating a critical lift with a standard single crane operation. At the end of the bar is a custom counterweight system, which easily adjusts to meet the blade’s center of gravity. A hydraulically powered unit can rotate the bar and blade on three different rotation points in either direction. The sling at the end of the bar is threaded over the damaged blade and another sling is eventually attached at the root end, which stabilizes and balances the blade. Once the blade is safely secured, it is disconnected from the turbine’s hub and the blade bar and blade are lowered to the ground. Among the blade bar’s further advantages is that one crane operator is in control of all operations versus two to coordinate. 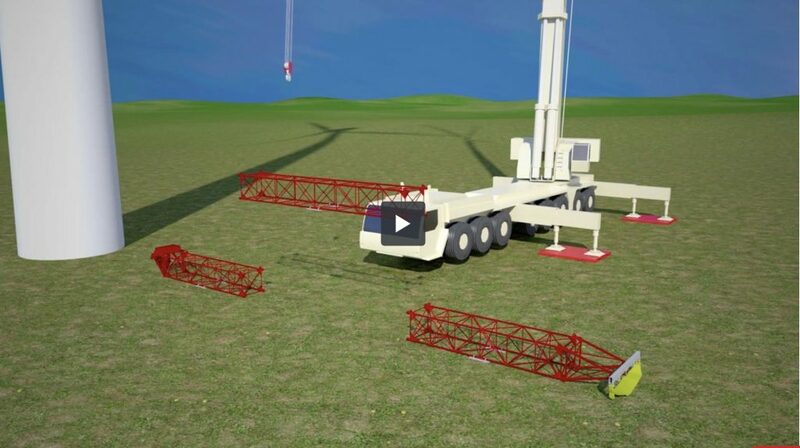 Smaller crane pad requirements also mean less environmental risk. The blade bar system is also able to handle higher wind speed operating limits. See the blade bar in action in this animation.